Some of the finest things in life are beholden to terroir. Wine, coffee, chocolate, cheese and olive oil all rely on environmental factors to give them character. Groves of olive trees can be found in every corner of our region, thriving on the differences among them. As well as producing award-winning oil under the Virtuo banner, the Olive Place plays an instrumental part in the industry by pressing for 50 to 60 other producers. Skinner’s grove includes seven variety of trees, which cross pollinate naturally. Whatever trees produce the best fruit will feature most in the final blend, making for idiosyncratic differences year to year, alongside the variables of terroir. Famous for its winery, restaurant and sculpture trail, lesser known is that Brick Bay produces its own honey and oil. The Oil Taster, when available, is served with bread, dukkah and olives. 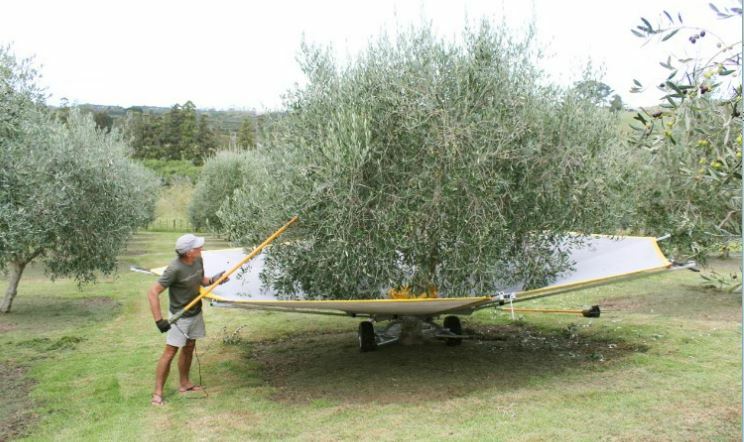 Formerly of Glenora Estate on Waiheke, husband and wife Sally and Derek Holland bought the property with an existing olive grove three years ago. Following an organic philosophy, they’ve won a number of medals and carved a niche with their corporate gift packs – matching oil with balsamic, wine and chocolate. Sally welcomes walking groups. The grove on this family-owned estate is unique in that all the trees are of the same colonial stock. They keep half their bi-annual production for personal use and sell the rest in squat jugs. The co-op combines the efforts of seven avid growers, who have eight groves across the region. They press small batches at Salumeria Fontana in Wellsford and bottle it at their facility among the groves in Warkworth. Tours by appointment. Halfway between Pakiri and Wellsford, this is the place to learn about the craft, get your own olives pressed, or stock up on the Virtuo range. Their headquarters also serve as a striking wedding venue. Margie also offers exceptional vinegars to go with her oils (Apple Balsamic and Spiced Merlot), and stylish reusable oil containers for refilling. These guys are multiple, international award-winners. Just along the road to Tawharanui, this is the place to go for a casual purchase. Husband and wife Ali and Tony bought the property complete with its bedraggled grove and thought they’d have a go. They were delighted to win a Best in Show Award in 2015, but Ali is equally happy to count 40 locals as regular customers. As well as bottles, there are stainless steel or tin options for bulk refills.